It seems that the end of the year is fast approaching and one thing that is celebrated in the UK every 31 October is Halloween. This is a special occasion where people - both young and old - dress up in scary costumes. To get you in the spirit of Halloween, we are going to look at some vocabulary and phrases. Be sure to use them! Children knock on the front door of a house in their street, the person who answers the door will be greeted by children shouting “Trick or treat?”. If the person says “Trick!”, then the children will play a small trick on the house owner such as spraying water or something else. If the owner says “Treat!”, the kids are then given sweets and they put it in a bucket for later. A witch is an old lady who is believed to have magical powers. A broomstick is the type of transport used by witches and you may have also seen them in Harry Potter. It is the broom which Harry uses to fly around. This is a magic stick which is used for casting spells. This was also in Harry Potter and if you go to Harry Potter World, you can buy your very own magic wand. This is all bones that create a person’s or animal’s body. You may see skeletons when you are out at night during Halloween. This is an orange vegetable which is often carved and hollowed out to make Halloween lanterns. Families will make their own pumpkin lanterns on Halloween, keep an eye out for them. A bad and scary dream. If you watch too many horror movies, you will have nightmares. This is a place where dead people are buried. ‘Graveyard’ is an American English word but the British English word is ‘cemetery’. If you are working the ‘graveyard shift’, this means you are working between midnight and the early morning. We will look at different American and British words in a future post. This is a dead spirit which haunts a house or other building. If you see them in movies, they are sometimes pale. The last word for the post is ‘mummy’. This is a dead person who is wrapped in bandages. You can obviously see mummies in the movie, “The Mummy”. Historically, mummies were from Egypt but they are very popular in horror movies as well. 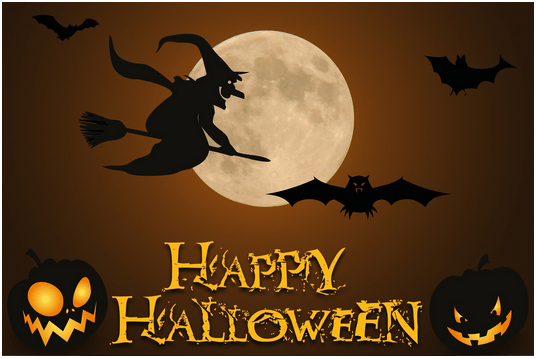 Have a wonderful Halloween and get dressed up in a scary costume as a mummy, ghost or skeleton. There are plenty of places in England which celebrate Halloween and you can meet other people in fancy dress.